"This easy-to-make granola is perfect for colder months, and will make your house smell amazing with toasty notes of pecans, sweet maple, and spicy cinnamon. Top it off with chopped dates for added sweetness." Pour applesauce, maple syrup, brown sugar, cinnamon, salt, vanilla and maple extracts, hemp hearts, and chia seeds into a slow cooker. Stir until well combined; add oats and pecans and stir again. Cook the granola in the slow cooker on high for 3 hours, venting the lid slightly. If you smell the granola cooking, it's time to stir. Keep an eye on it or it will burn if not stirred occasionally. Pour the finished granola onto a baking sheet lined with parchment paper and allow to cool completely. Store in an airtight container and enjoy! 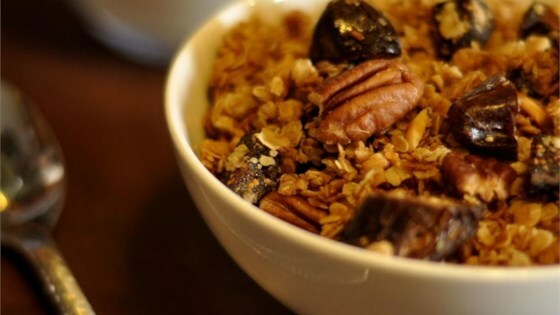 Preparing granola in the slow cooker is an easier method than in the oven since it is less likely to burn the granola. The added hemp and chia seeds will provide a great extra source of protein. Placing a chopstick between the slow cooker insert and the lid is an easy way to vent. This is pretty good. I baked it like the first reviewer as well, about 45 minutes in a regular oven at 350. Flavor was good. Definitely will make again.